Get started with Zotero, the powerful citation application that allows you to save references, create bibliographies automatically, and build a personal database of the sources you use. 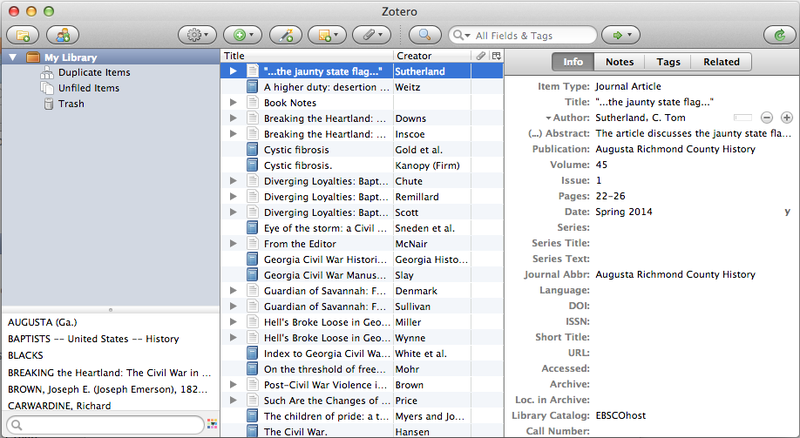 Zotero is free, librarian-approved and easy to use. THIS IS AN ONLINE WORKSHOP CONDUCTED VIA WEBEX. You will need speakers or headphones, or you can listen via phone. You do not need a microphone. The workshop URL will be https://gsumeetings.webex.com/join/jpuckett. Please connect a few minutes before the workshop starts, especially if you have never used WebEx. You may need to install some software. Under Audio Connection, select either "Call Using Computer" or "I Will Call In" and follow the instructions. You may (optionally) want to install Zotero ahead of time to follow along. Instructions are here; contact Jason if you have questions or problems.